Add some nuttiness to your frozen sweets with Toasted Almond Ice Cream Cake. 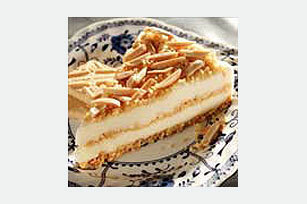 Toasted Almond Ice Cream Cake is perfect for special occasions or everyday. Sprinkle 1 cup of the crushed cookies and 1/3 cup of the almonds on bottom of 9-inch springform pan; carefully spread half of the ice cream evenly over cookie mixture. Repeat all layers. Top with remaining crushed cookies and almonds; press into ice cream with back of spoon to secure. Cover. Remove side of pan. Cut dessert into 16 slices to serve. Store leftover dessert in freezer. Spread almonds in single layer on baking sheet. Bake at 350°F for 5 to 7 minutes or until lightly toasted.